HOW CAN EARLY INTERVENTION SERVICES HELP MY CHILD AND FAMILY? NOW THAT MY CHILD IS ELIGIBLE FOR EARLY INTERVENTION SERVICES, WHAT WILL HAPPEN NEXT? If you choose to participate in Early Intervention Services, an Individualized Family Service Planning meeting will be held with you and anyone else you choose to have present. The Service Coordinator, a member from the evaluation team and your service provider will work with you to develop an Individual Family Service Plan (IFSP). Your IFSP document will identify your child's and family's strengths and needs. The IFSP will also identify the supports and services that will help your family meet the needs of your child. The IFSP will tell you specifically who will provide services, when they will begin, how frequently they will occur and for how long the service will last. WHAT IS THE PHILOSOPHY OF EARLY INTERVENTION? Our mission is to enhance each family's ability to help their child learn and grow. We work with you, and anyone else important to your child and family, offering tips, techniques, and strategies that can be used throughout the day. Generally, one member of the early intervention program's staff will visit your family/child at home, day care or other location as indicated in your IFSP. 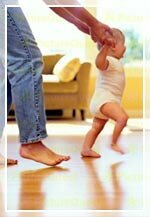 It will often look like we are "just playing" with your child. That is because babies and toddlers learn new skills when they are happily playing or busily involved in everyday activities like eating, bathing or diapering. Teaching Javier to point to the food or his cup of juice during meals teaches him an important way of communicating his wants and needs. Playing a tickle game with Hailey during diaper changes is a great way to help her learn the names of her body parts. Putting toys on the couch is a good way to motivate Cole to crawl to the couch and pull up to a standing position. We will make suggestions of things you can do throughout the week. We will try to answer your questions. We will help you find answers that you need from other professionals. We will honestly discuss your child's progress and need for any other services. WHO WILL WORK WITH ME FROM THE EARLY INTERVENTION PROGRAM? Early Intervention staff are child development specialists who also have individual expertise in a specialized field such as special education, nursing, social work, physical therapy, occupational therapy and speech and language therapy (this is not a complete list, just some examples). They will help your family look at your daily life and find activities, times, and strategies to help your child learn new skills. There may be times when you and your interventionist consult with other professionals. HOW CAN I ACCESS ADDITIONAL SERVICES? Early Intervention may not meet all of the needs of your child and family. Depending on your family size and income, you may have a monthly co-payment. Your service coordinator can guide you through the financial eligibility process. your service coordinator can also help you access services through insurance, and can help you find support groups and activities for children that are offered in your own community.